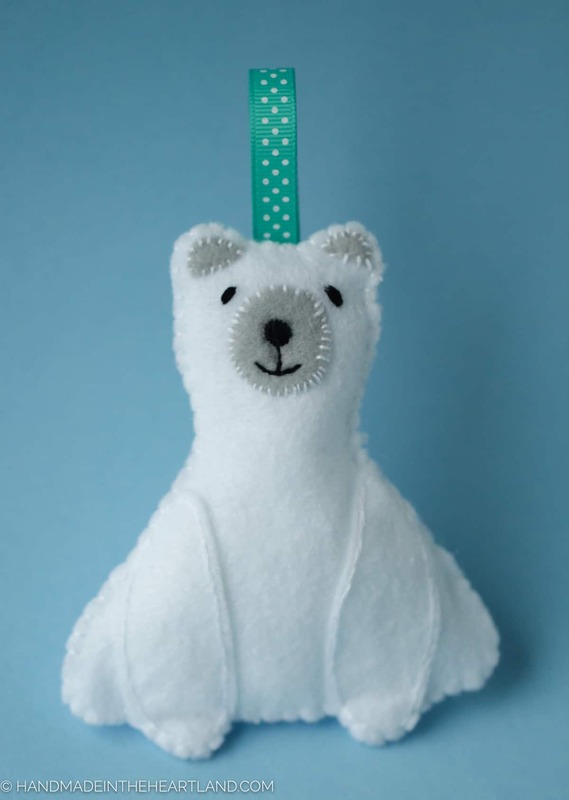 This polar bear ornament makes a wonderful handmade gift. I love gifting ornaments because they can create a memory from year to year. Looking for more fun gift ideas? This hot chocolate gift is perfect for a last minute gift. If you have a teen on your list they might like this candy wrapper zipper pouch. 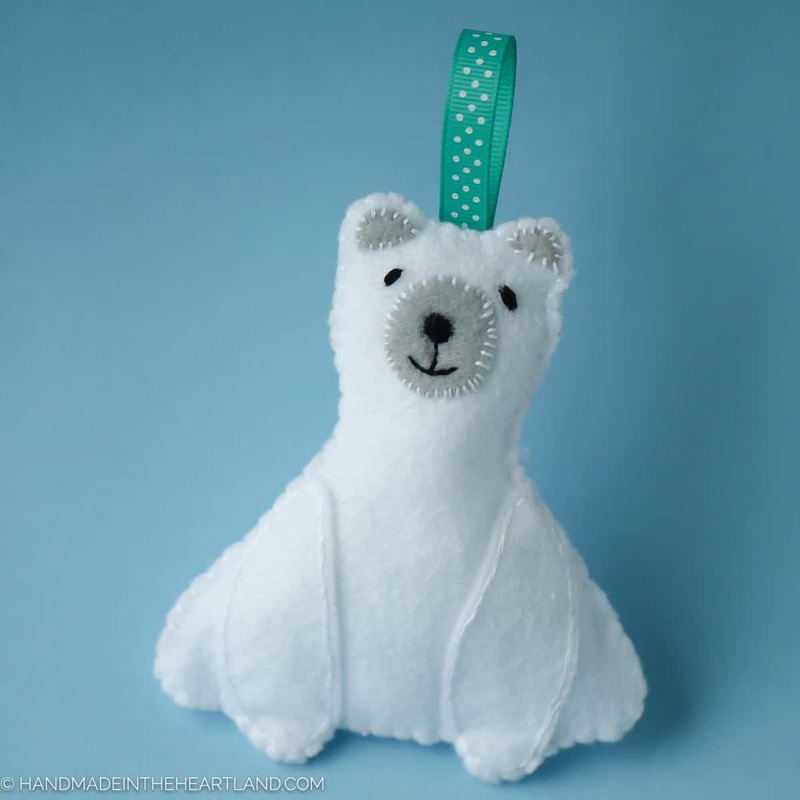 This polar bear Christmas ornament is simple to make and a darling addition to your Christmas tree! Making it with the free printable pattern will take you no time at all. Hi! 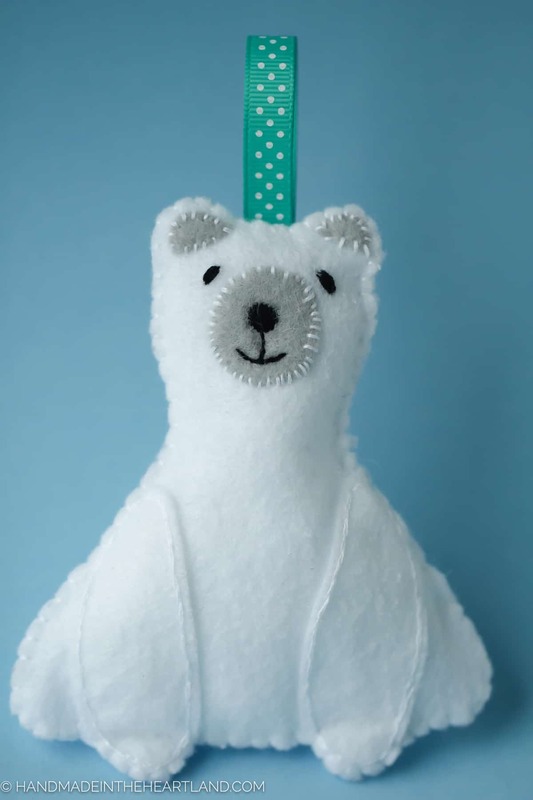 I’m Angela from Handmade in the Heartland and I’m so thrilled to be sharing this fun polar bear felt ornament. It’s simple and fun to make and isn’t he just too cute?! I’ve been really into making fun little felt ornaments lately, check out my DIY felt penguin ornament. This project is easy, just cut it out and hand sew it together with a little stuffing in between. The first step is to print out the pattern. You can download it HERE. 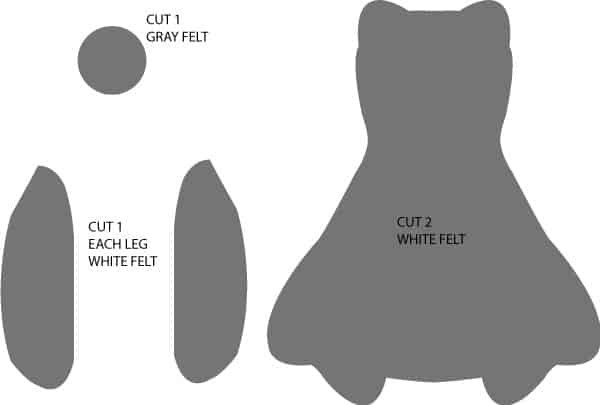 Step 1: Using the white felt cut out the bear body and legs, cut the circle for the nose area out of the gray and freehand cut 2 tiny little half moon shapes for the ears. Step 2: Pin the legs to the body of the bear and then hand sew them down together. Do the same with the circle for the nose area and the little ear shapes. Step 3: Use the black embroidery thread and stitch on a nose, mouth and eyes. After the front of the bear is finished sew the front of the bear to the back of the bear. Make sure to sew the ribbon in between the two layers at the top and then leave an inch or two opening to stuff it before closing it up. Step 4: Stuff the ornament with a little bit of poly-fil and then finish stitching him up. Voila! You’re done! I have to say Thank You to Cindy for letting me pop over and say hello to all of you and share this fun DIY polar bear ornament with you! You might also like these fun ideas for the holidays! Will be using your gift and colorful gift tags. Thanks for sharing these and other patterns. Have a great holiday season!